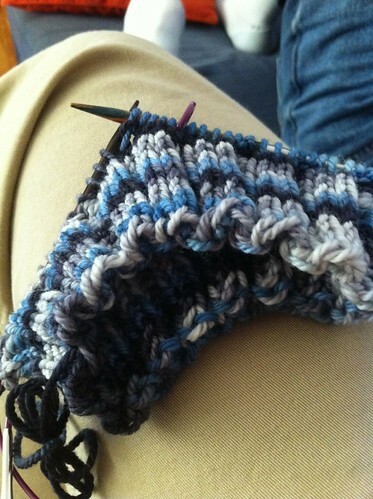 Jasmin is working on the KAANTINEN Reverible Rib Cap, re-engineered to fit a baby. She finished the interminable ruffle on her Sothia. 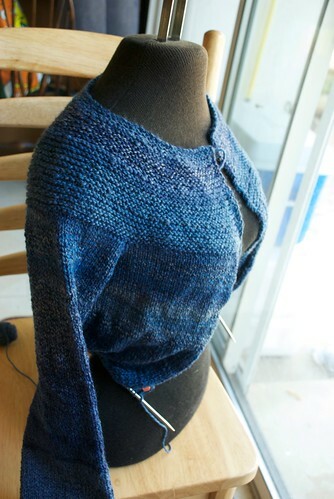 Jasmin has finished the knitting the Baby Blueberry Cardigan out of Claudia Handpaint and Cascade 220 sport. Only the handsewing remains. The Oat Couture Prairie Blanket is coming along nicely. The Garter Yoke cardigan out of Jasmin's hand spun ( Susan's Spinning Bunny is BFL color blue jeans, and Lorna's laces, Merino, color jeans) is progressing nicely. 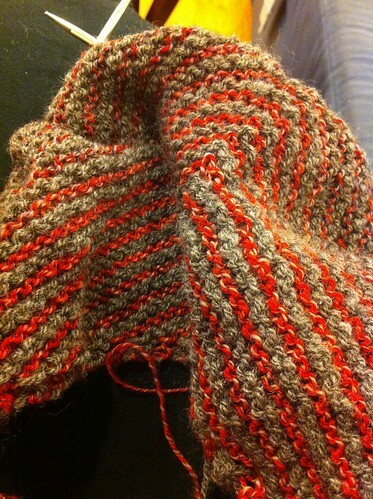 Gigi has finished Romi Hill's Taygete. The knitting is finished but it hasn't been documented. We learned a new acronym: POIDH Picture or it didn't happen. She is also working on her second Ophidian by Sivia Harding and complaining because the needles she is using aren't as sharp as the Chia-goo needles she used on her last project. She is also working on the Sothia, out of Abstract Fiber in Mighty Sock. And a non-descript vanilla sock. 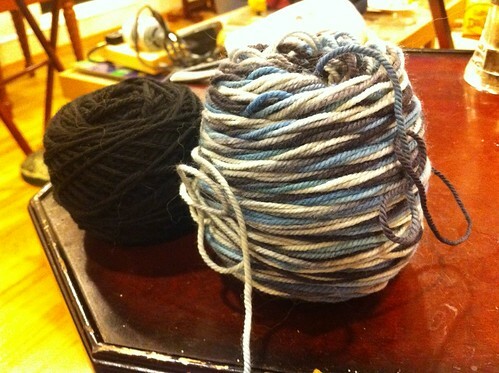 The question we answered from the thread is :How to improve and add to skills as a knitter. Pick whatever skill interests you most and go for it. The See One, Do One, Teach One technique was discussed and recommended. We mentioned the Market Squares Bag from Knitter's Magazine. Gigi is sewing a quilt our of Dr Seuss fabric from Beverly's with the Contra Dance pattern from Quilt Woman.com Designs. She is using a seasonal table cloth with a flannel lining as a design wall. Entrelac: The Essential Guide to Interlace Knitting by Rosemary Drysdale. We liked the swatches and the photography. We would have liked more photos of the garments. 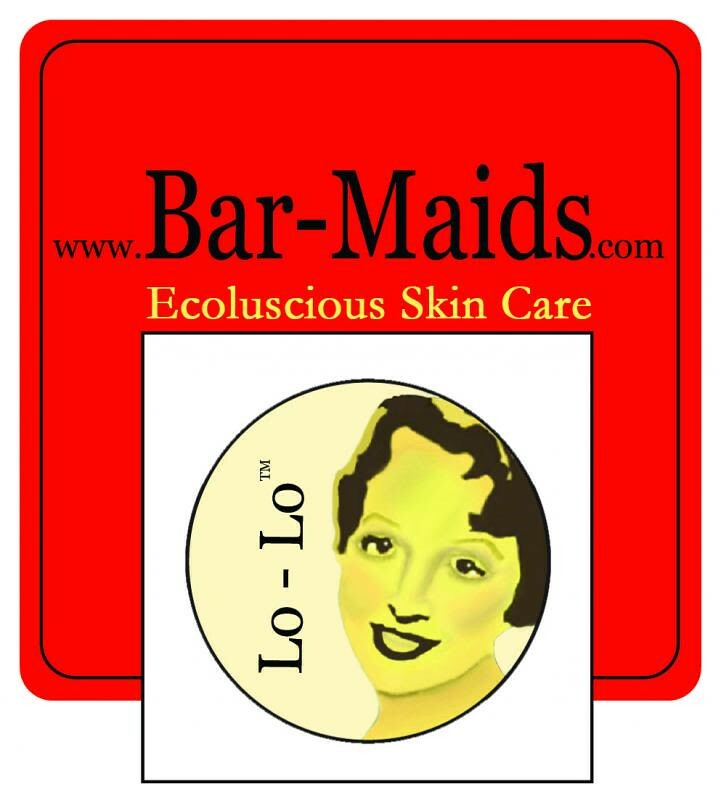 (We really like the Lady Eleanor, and Entrelac Baby Blanket from Knitter's magazine better.) Jasmin liked the poncho and Gigi liked the wrap with angora. We liked the swatches, the garments not so much. Jasmin has been plying her singles for the Ten Year Sweater. She uses her Woolly Winder exclusively for plying because it packs the yarn tightly. She also uses the Fricky Skein winder, because it measures yardage. 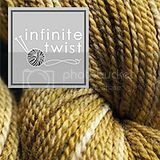 When she is done skeining her yarn, she ordered cards from Vista Print to label her handspun. David after dentist video. And she is almost half done with the Oat Couture Prairie Blanket. Gigi is working on Romi Hill's Taygete, putting on the edging, a pair of Vanilla socks with an afterthought heel, a premie hat out of leftover sock yarn, her second Ophidian by Sivia Harding, in Cascade Heritage. Answering how to fit knitware into daily wardrobe. More solid colors are easier to match. Knitwear is supposed to be the show piece, so the wardrobe needs to be edited to show off the knitting. Gigi forgets to read her instructions and had to pull out most of the stitches she had picked up for the edging. Also, she managed to spill beads for the Ophidian all over the couch. A Life in Stitches by Rachel Herron. Not a romance novel but about the love of yarn, and knitting and people. Jasmin has been reading her blog, for years. Some parts are sad. Jasmin is working on a tablecloth and napkins out of linen from Mood. She is working on straightening the edges and hemming. Her 1975 Singer Touch and Sew is disagreable, and challenging. Gigi confessed that she is running a halfway house for wayward sewing machines. Fabric needs to be cut on the straight of grain so garments hang straight. To compensate for shrinkage and straightening loss, one needs to purchase a bit more fabric. They are thinking about doing pulled thread hems for the napkins by hand. Jasmin is working on plying yarn for Andrew's 10 year sweater. Gigi will be spinning soon on a borrowed spinning wheel.